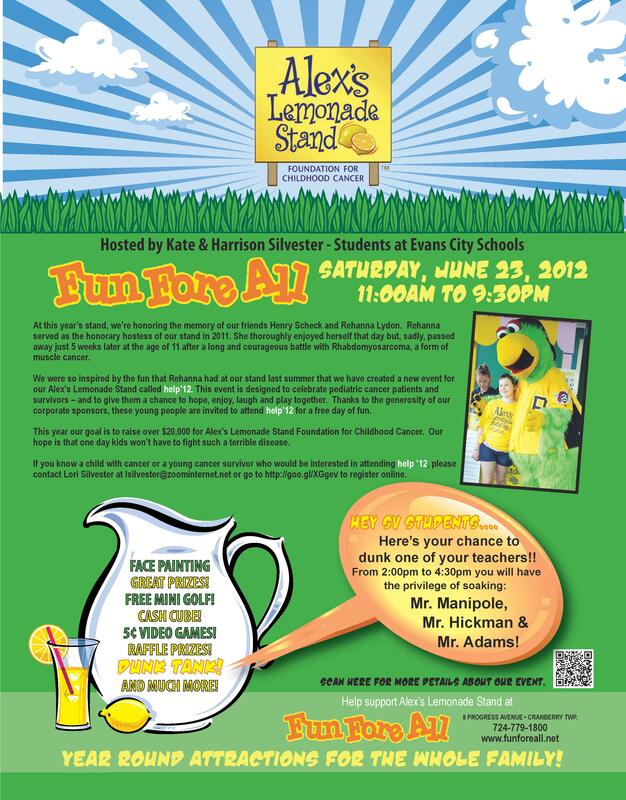 Join us at our 4th annual Alex's Lemonade Stand at Fun Fore All in Cranberry Twp. This year's stand is in memory of our friend Rehanna Lydon (who passed away just 5 weeks after being an honorary hostess at our stand last June) and our friend Henry Keating Scheck (who passed away in February of 2009). We were so inspired by the fun that Rehanna had at our stand last summer that we have created a new event for our Alex's Lemonade Stand called "help '12. ""help '12" is designed to celebrate pediatric cancer patients and survivors – and to give them a chance to hope, enjoy, laugh and play together. In addition to all of the fun activities that are available every day at Fun Fore All, at "help’12" our special guests will enjoy the activities of our lemonade stand, such as a visit from the Pirate Parrot and Garrison Carida’s Star Wars characters, the PNC Cash Cube, a dunk tank, face painting, Eat ‘n Park cookie decorating and basket raffles. Lunch and, of course, lemonade will also be provided to our help '12" attendees. If you will be in the Cranberry Twp., PA area on June 23rd, and would like to register a pediatric cancer patient or survivor for "help '12," please contact Lori Silvester via email at [email protected] or by phone at 724-831-1014 or register online at http://goo.gl/XGgev by June 15, 2012. Lori, thanks for all you do! The stand is tomorrow! Join us at Fun Fore All from 11am - 9:30pm for tons of fun, activities, and -- of course -- lemonade! Pirate Parrot 11:30 - 12:30 Everywhere! Star Wars Characters 1:00 - 4:00 Everywhere! Thank you to all of our friends and family for making our On The Border Give Back Night such a success! On The Border Restaurant is going to send us a check for $250! WooHoo! We just raised over $10,000 at the Pens Foundation Charity Assist Raffle at Consol Energy Center! We saw first hand what great supportive fans the Pittsburgh Penguins have, but we couldn't have done it without the efforts of our great family and friends. We had over 30 volunteers that helped us sell the raffle tickets. Thank you to everyone that helped us! Nice work and thank you team!